Today’s session dives into the truth about email unsubscribes. Unsubscribes are a metric that most retail marketers dread. As a result, they often track unsubscribes on a very regular basis to monitor for any spikes. But what should your team look out for when it comes to unsubscribes? Let’s review common circumstances surrounding unsubscribes, the cost of those unsubscribes and tips to decrease your unsubscribe rate over time so that you can increase revenue from and engagement with your email marketing program. 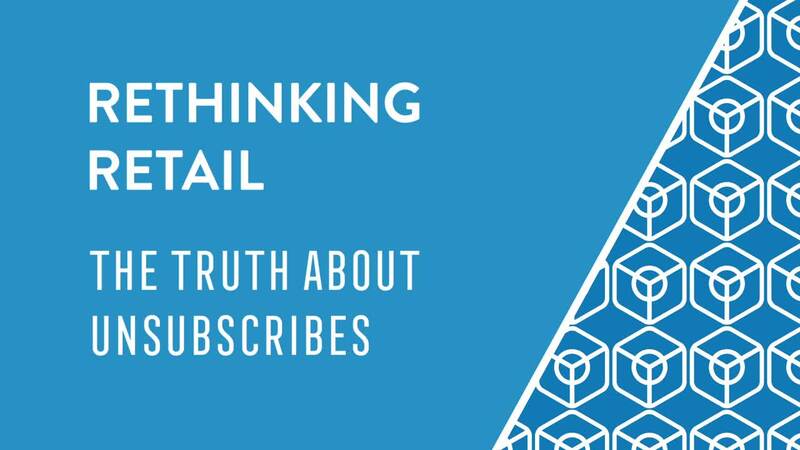 We looked at three million email addresses that have unsubscribed from retail marketing lists and found that the overwhelming majority of them (77%) come from non buyers. These are shoppers who likely signed up for a retailer’s email program to receive a deal, didn’t convert and then opted out from communications. Looking beyond these non buyers, we found that shoppers who do convert typically unsubscribe after that first purchase. This finding — that the window between the first and second purchase is the time when customers are most likely to unsubscribe — represents another highly compelling reason to focus on turning one-time buyers into two-time buyers. When we look at the timing of unsubscribes over the course of a year, we see a huge spike around the holiday season. These unsubscribes likely come from shoppers who buy a gift from a certain retailer or sign up for emails in pursuit of a Black Friday deal, so it’s not surprising to see them unsubscribe shortly after they get what they need. With that in mind, as we head into the holiday season, remember that you will probably see a big spike in customers signing up to receive emails over the next month, but you will also probably see a big drop off after that. Next, we tracked how many days after email sign up unsubscribes typically happen. For non buyers, the average time to unsubscribe is 47 days after email capture. That confirms these shoppers are probably looking for a deal, don’t end up converting and then opt out. Looking at all shoppers, the average time to unsubscribe is 70 days after signing up for emails. That means there’s a small window from when retailers first acquire a customer to when those shoppers unsubscribe. It also indicates an opportunity to rethink your welcome series and customer onboarding flow to keep those messages as relevant and timely as possible in an effort to convert more customers. We then found the difference in spend between those groups on an individual customer level, which came to approximately $18 per customer for retailers with a $50 average order value and $36 per customer for retailers with a $100 average order value. Looking beyond one customer, that means that every 10,000 unsubscribes costs retailers between $180K and $360K in potential revenue depending on their average order value. Now that we’ve identified the cost of an unsubscribe, let’s review some of our top tips to decrease your unsubscribe rate and increase email revenue as a result. Think about the types of shoppers whose email addresses you acquire and how you’re doing so. A lot of retailers have an email pop up box that aims to capture the email address of every site visitor, but it pays to consider the quality of customers you acquire via email, because that’s likely to affect their engagement with emails and propensity to stay subscribed over time. Sort your email campaigns based on unsubscribe rates and work to optimize the campaigns that bring in the most unsubscribes. As you do so, think about how can you tweak areas like messaging, audience and timing to reduce unsubscribe rates from those campaigns. Take advantage of predictive models that evaluate customers’ likelihood to unsubscribe and then automatically remove shoppers with a high likelihood to unsubscribe from your email campaigns. Ideally, you want to let those customers’ inboxes cool down a bit before you email them again. In the meantime, you can reach those customers on other channels, like Facebook and search. All of that said, remember that some unsubscribes are natural and are critical to having a healthy email marketing program, so you never will (nor should you want to) see an unsubscribe rate of 0.00%. Are You Ready to Rethink Your Unsubscribe Rate? There you have it: A look at who unsubscribes, when they typically unsubscribe, how much those unsubscribes cost your brand in lost revenue potential and our top tips on how to stem those losses and decrease your unsubscribe rate. For more on what you need to know about unsubscribes and tips to maintain a healthy unsubscribe rate, check out our eBook on the cost of an unsubscribe. Data from 400 retailers identifies who unsubscribes, pinpoints common circumstances surrounding unsubscribes and quantifies the cost of those unsubscribes. Unsubscribes lead to lost revenue, but some unsubscribes are critical to a healthy email marketing program. Here are 5 reasons not to fear all unsubscribes.